My mother in law is one of the most amazing violin teachers I've ever met. She teaches kids in a "Suzuki" method. When kids ask how often they should practice, Dr. Suzuki's answer is that you only have to practice on the days you eat. In this tradition they also do a song 10,000 times before that song is mastered. As a musician myself, I apply a daily discipline to my metalsmithing. I often challenge myself to try something new. Trying it once is not enough, getting it right once is not enough, so I relentlessly pursue it until it becomes a part of me. I think that there is some magic with number 10,000. Yep, 10,000 of anyone thing is a lot of doing. 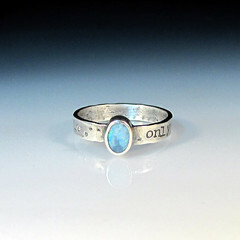 This ring reminds me that I have to work at my art "only the days you eat".